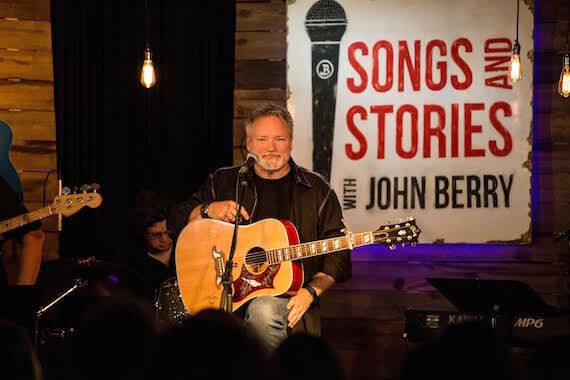 John Berry is sharing tunes and tales from 25 years in music during his new weekly show, Songs and Stories With John Berry, a 30-minute program which airs on The Country Network and The Heartland Network, and bringing along several artist friends to do the same. First season guests include Billy Ray Cyrus, Craig Morgan, Clay Walker, Mo Pitney, Lee Roy Parnell, Collin Raye, Neal McCoy, Billy Dean, Suzy Bogguss, Mark Wills and Delbert McClinton. Each show is filmed at Nashville’s Douglas Corner, where Berry first showcased his music and earned his first major label deal. The show is produced by Jeff Moseley/CJM Productions. Songs and Stories With John Berry airs on The Country Network each Monday night at 9 p.m. ET, with re-airings on Tuesdays (11 a.m./8 p.m. ET), Wednesdays (10 p.m. ET), Saturdays (3 p.m. ET) and Sundays (7 p.m. ET). The Heartland Network airs the program on Thursday evenings at 8 p.m. ET, with re-airings on Fridays (5 p.m. ET), Saturdays (9 p.m. ET) and Sundays (7 p.m. ET). In addition to The Heartland Network and The Country Network, the show can be seen on Keep It Country TV (Europe), The Family Channel, the Angel Two Network, AMG TV, and the VTN Network.